Daredevil #5 is a wonderful example of why this (and the “previous”) volume of Daredevil has been so successful. It accomplishes the seemingly impossible task of combining “real” issues, stories and relationships with out-of-this-world scenarios of supervillains gone mad and superheroes mingling with red blood cells and macrophages (at least I think they’re supposed to be macrophages, right Chris Samnee?). Daredevil is still for grown-ups, and it does feature mature characters with very serious grown-up problems, they just happen to find themselves in situations that show us that their creators don’t shy away from using the genre to its fullest, including choosing from some of the more absurd toys in the sand box. This balancing act is evident in the art as well as the overall themes. It is obvious that Chris Samnee is a gifted cartoonist who enjoys putting an extra bit of humor in the scenes warrant it. 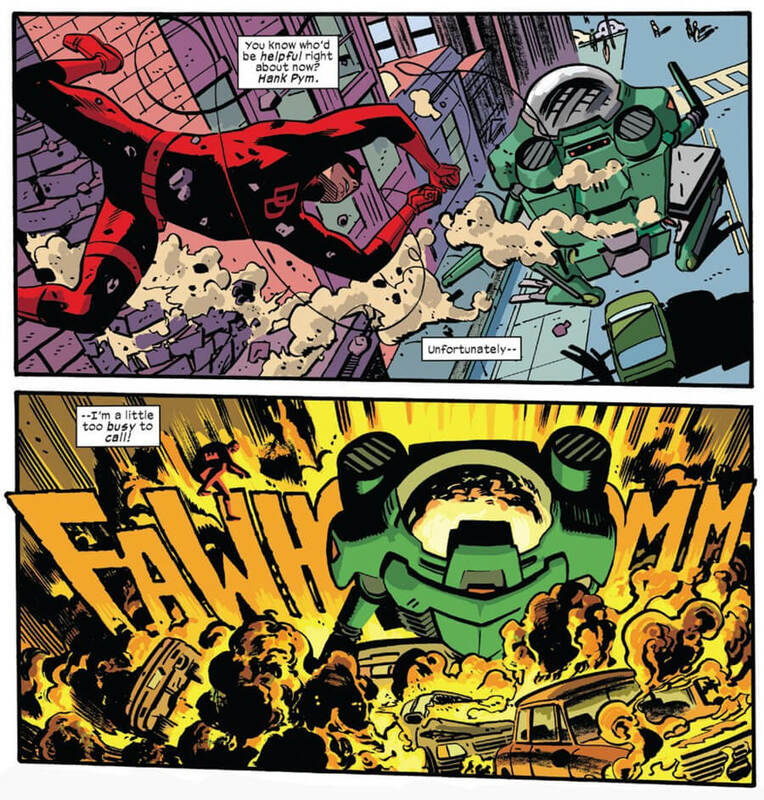 At the same time, while his is far from the realistic styles of the volume 2 Daredevil artists, characters and landscapes are beautifully proportioned and well-designed. In this approximation of the real world, giant frog robots and tours of the human cardiovascular system make perfect visual sense. This brings me to the specifics of Daredevil #5. We were promised the details of Foggy Nelson’s apparent death, but get an issue that delivers so much more. I had some complaints about the pacing last issue, but this time around, the team is back to the smooth sailing I’ve come to expect, and then some. Once again, team Daredevil pack a seemingly impossible amount of stuff into one issue. Both the line art and coloring are outstanding here. The subtle shadows cast by the leaves of the trees in the park, the unique details of all the people and big “oomph” of color on top. This is Javier Rodríguez’s final issue as colorist and he certainly goes out with a bang. The sudden appearance of an old villain with a very serious power upgrade makes perfect sense in the context of the conversation leading up to it: Daredevil’s true identity is now public knowledge, once and for all, and this gives old foes plenty of reason to come out of the woodwork. Matt and Foggy are chased through the park and into a perfect set of circumstances which give way to an idea spurred at the last minute that will not only save the lives of hundreds but give Foggy the kind of “death” that will keep him safe from harm. The execution is flawless, and all the little details make this tale seem downright inspired. This issue is huge on character moments. This team has done wonders with the already solid Matt-Foggy bromance and Daredevil #5 really gives you the sense of what it’s like to be Matt Murdock’s best friend: often exasperating, sometimes dangerous, but never boring. And never without the sense of the strong brotherly bond the two of them share – for better or worse. This issue was a very solid an thoroughly enjoyable read, and while Rodríguez’s colors will be sorely missed, Waid & Samnee et al show no signs of slowing down. Keep doing what you’re doing! By far, my favorite comic right NOW. Thanks for these thoroughly enjoyable reviews – they compliment Waid and Samnee’s stories. And, yes, Rodriguez will be missed. Any idea on the length of Waid and Samnee’s respective commitment to the comic? My favorite issue of volume 4 so far. Excellent issue. Waid thrives when it comes to the character interactions between DD / Matt and his supporting staff. Especially with Foggy. Samnee’s art is top notch and has been the entire new volume, if not his entire DD run. The colors defined the tone of the story and blend well with the pencils / ink work. Javier will be missed on this title. Great, and a bit original, way to show the “death” of a main character. Loved the smile on DD when the idea of how the death should play out came to him! You know, as a freelance portrait and fantasy character designer, I thought many people wouldn’t notice the shadows of the leaves on Matt and Foggy as they walked through the park. … I’m glad to see even the little details don’t go unnoticed with you. This is definitely my favorite issue of vol. 4 so far! Loved it. The pacing was awesome and it really was the perfect blend of touching character moments and high action, what more could you want from a comic with great art to boot. As someone who is watching a close relative fight cancer right now these issues with foggy pull at my heartstrings. I can promise you that the people fighting this terrible disease in all its forms are people without fear!!! So the themes are very in line with the title, and it brought a smile to my face that Foggy got to “go out” swinging. It was just such a DD move to let the underdog get his day to be raised up as a hero. 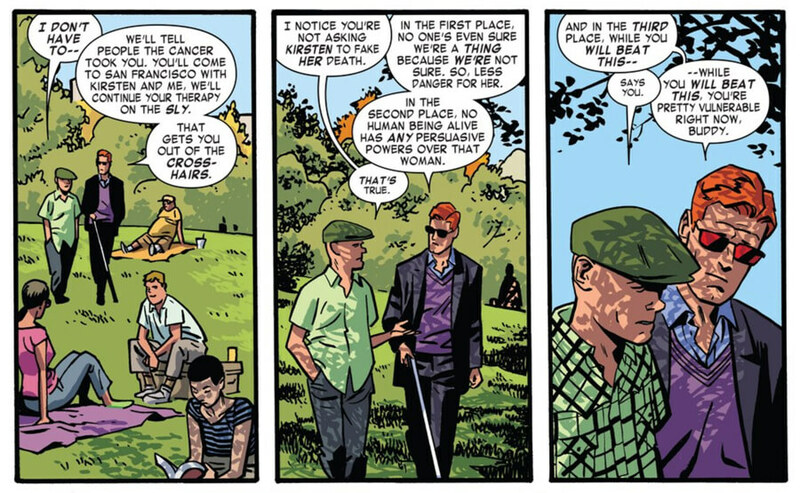 In everyway but the physical fighting Waid is letting Foggy shine as a Daredevil equal to that of Matt. For that (and many other things) I think Waid and co. deserve a hand. Foggy as a character deserves it. At the same time Matt also gets to shine and the creative team continues to show how much of a grasp they have on the deep and complex nature of the character and his relationships with his supporting cast. The line about Matt overstepping his bounds and helping to much, even to the complete annoyance and insult of those he’s trying to help, but still having his heart in the right place and being a good friend was really spot on. And who doesn’t like a good giant robot fight!?! But yeah this one made me smile and even brought a tear to my eye, good stuff. Cannot wait for more.